Dorset Community Energy is a not-for-profit Community Benefit Society whose aims include financial and educational benefits to schools. We have developed educational resources to support the schools with solar panel installations financed by Dorset Community Energy. We are currently seeking funding to enable us to work with teachers to develop more sustainable energy teaching resources and to roll these out to all schools in Dorset. 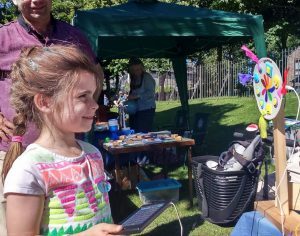 Dorset Community Energy shared an environmentally themed stand with the Churches Together Ecology Group at the annual Dorchester One World Festival. 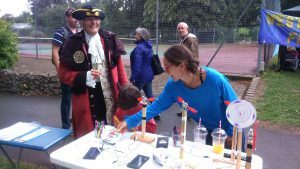 In spite of showers it was a fun event, but something of a challenge for children to decorate solar powered paper plates using washable felt tip pens during a rain shower! However it was very interesting to see the solar panels working well in the rain!! 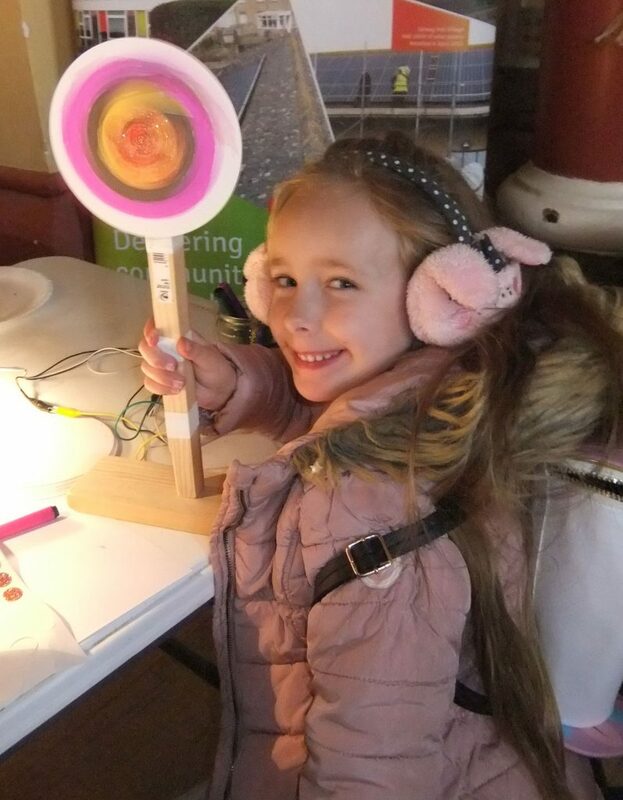 Pete West, the secretary and a director of Dorset Community Energy, was pleased to offer childrens’ solar workshops at the Inspire Dorset community event held in the Corn Exchange, Dorchester on Saturday 17th February. The well-attended event was organised by an Inspire Dorset group supported by Dorset Community Action. The overall project aim is to help participants learn new skills and build confidence in order to gain employment. Local artists and craftspeople supported the community event, including offering hands-on craft workshops for children and families. 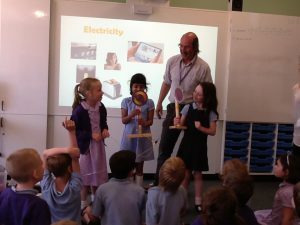 To date Dorset Community Energy has only been able to provide solar energy monitoring equipment and educational activities for a limited number of schools. Now, we have secured a grant of £1,750 from the Postcode Local Trust (a grant-giving charity funded by players of People’s Postcode Lottery www.postcodelocaltrust.org.uk) for monitoring equipment to be installed in an additional 2-3 schools. The monitoring will allow pupils and staff to see how much electricity is generated by the solar panels each day and how much this compares with the electricity used by the school. Schools can borrow a box of solar experiments including solar panels and small motors and an associated resource guide. The experiments and guide have been developed by Alison Jay, the Dorset County Council Sustainable Schools Project Officer and a small group of Dorset Community Energy volunteers. 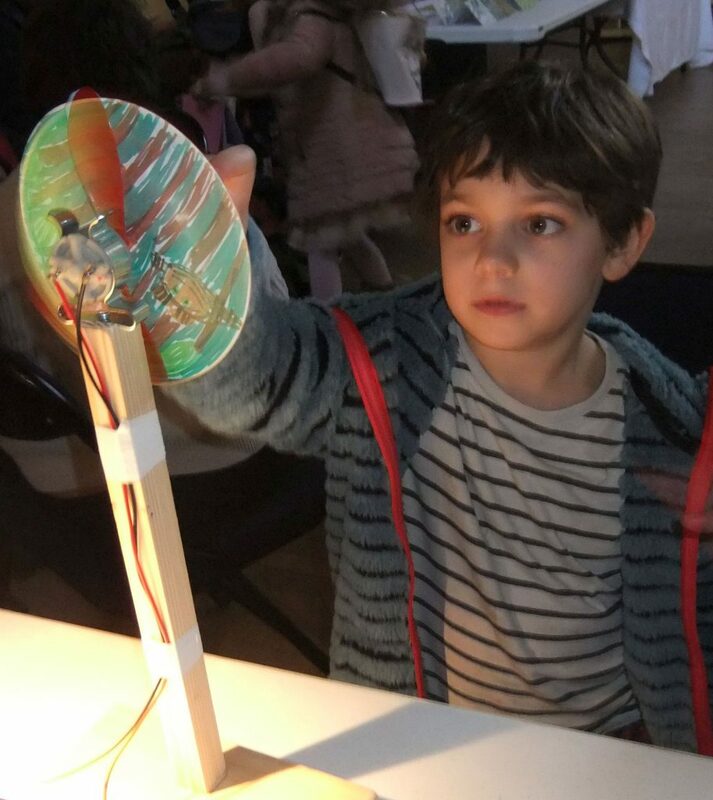 Simple experiments such as decorating a paper plate and mounting it on a small solar-powered motor have been a great success with younger pupils. Children are fascinated by the way the spinning colours change as the solar panel is tilted at different angles to the sun. We also supply a multimeter so the children can see the voltage change as the decorated paper plate spins slower and faster. Pete West, Dorset Community Energy secretary and a volunteer helping with educational activities, has produced a short video to demonstrate how to make a spinning paper plate solar model, which has proved popular with children of primary school age. It’s great fun and helps kids understand how things work. Dorset Community Energy has been piloting state-of-the-art monitoring systems to enable pupils and school staff to view the daily solar energy generation online from any computer in the school and via a wall -mounted display screen in the school foyer. 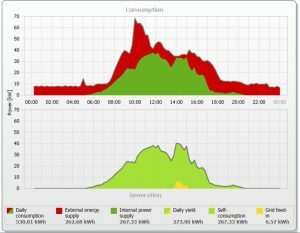 Where technically possible we have also installed energy metering to show grid electricity consumption and solar PV generation on the same screen. For example, the graph on the right shows daily grid consumption in red, solar PV generation in green and exported solar in yellow. We are delighted that the monitoring shows some schools are carbon neutral in electricity on sunny days and are using most of the solar generation within the school. ﻿More solar installations on schools expected in 2019, your chance to support!